If the Indian and Pakistani governments clear the investment and joint ventures obstacles between the two countries, then you could soon see the world’s most low-priced car cruising down Pakistani roads. According to recent reports, Pakistani business house, the International Multi Group of Companies who deal in film imports and edible oil, among others, have expressed interest in bringing Tata Group vehicles, including their CNG buses and the Nano to Pakistan. The global chairman of IMGC, Amjad Rashid, said on Wednesday that they already had a letter of intent with Tata, as they were interested in the company’s CNG buses. 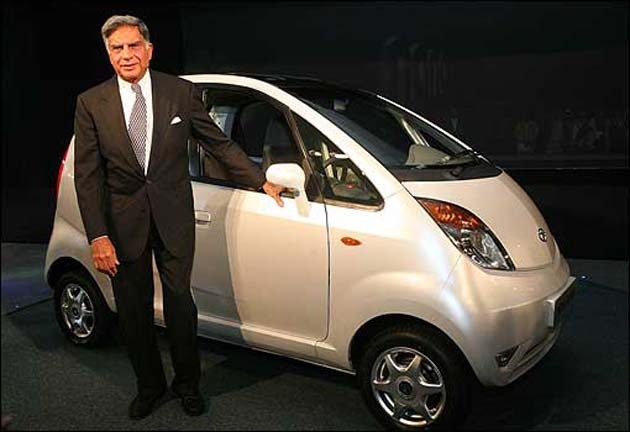 They are also interested in bringing the Tata Nano to India later on, if the various trade policy restrictions between Pakistan and India are removed. The plans of the IMGC to bring Tata’s CNG buses to Pakistan were put on hold following the trade policy restrictions in Pakistan which allows import of limited vehicles to the country, making it compulsory for most of the imported vehicles to be CKD units. It is not just the Pakistani government, however which had trade policy restrictions; the Reserve Bank of India also forbids investments and joint ventures with Pakistan. Rashid added that he had raised these concerns with Rahul Khullar, the commerce secretary for India, when he visited Islamabad in April for talks with his Pakistani counterpart. Khullar had then promised that these restrictions would be removed. Rashid further added that his group, having an annual $200mn turnover is interested in bringing the Nano to Pakistani markets. According to Khullar, their ultimate objective is to bring the Nano to Pakistan. They have already prepared a letter of intent, and once the roadblocks are removed they would soon import Tata’s CNG buses and later on the Nano to Pakistan. IMGC, which is one of Pakistan’s largest edible oil manufacturer also has other interests concerning collaboration with Tata, in sectors like technology. Apart from manufacturing edible oil, they are also Pakistan’s largest Indian film importer. According to Rashid, they brought 30 different Indian films to Pakistan last year and have already signed to bring in 15 films for 2011. They are also in the process of closing a deal concerning digital film technology, which will eliminate the need to import film prints, as they can be imported in digital files. A delegation from Tata group had been to Pakistan two years back to hold meetings with many leaders and senior officials which included the Commerce and Industry Secretaries as well the Chief Minister of Punjab, Shahbaz Sharif. The delegation had then expressed their interest in donating some of their CNG buses to Pakistan. Tata however backed out of these business ventures, following the terror attacks in Mumbai in 2008, when militants targeted iconic Mumbai locations including the Tata owned Taj Mahal and Palace Hotel. With the recent peace process between India-Pakistan resuming, many business proposals which were in the offing between the two countries have resumed. Rashid was present among the many Pakistani businessmen who took part in the meetings held during the visit of commerce secretary, Khullar to Pakistan for discussing the various ways to expand their trade cooperation, which includes permission for investments and joint ventures. Traders from Pakistan are looking at India as an important market for their products which include textiles and cement, whereas India is viewed as a low cost provider of technology as well as products like Nano, which priced at Rs. 1 lakh is the cheapest car in the world, launched in 2008.